This limestone headstone with shallow rounded top and engraved lettering in a mixture of Gothic and Roman script, in the parish area of St Edward, is located beside the central path about 20 yards north of the centre circle. There are five graves in the St Edward area for the Bays family, the other four being (Charles and Mary Bays), (Emmeline and William Bays) and (Agnes Mary Bays). There is also a grave for another branch of the Bays family in Cambridge (Frances and Mary Ann Bays). 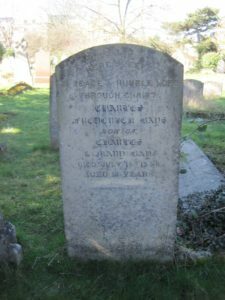 Charles Frederick was born on 4 August 1841 in Cambridge, and baptised at St Edward’s Church on 21 September of that year, son of Charles Bays, hatter, and his wife Mary. The family lived at 11 King’s Parade, and had at least nine children, including Alfred Charles (c.1836‒), William (1836‒85), Agnes Mary (1839‒86), Edwin (1843‒), Emily Mary (1845‒), John Bonfoy Rooper (1847‒), Henrietta (1848‒), and Emilia (Emily) Rosa (1852‒). Charles Frederick died on 15 July 1853 at the tender age of 12. His body was buried on the 21st of the month in Mill Road Cemetery, in row XXXIII of the parish area of St Edward, in plot 5 at a depth of 9 feet. There is, however, confusion because the grave book states that William and Emmeline Bays were buried in the same plot as him, whereas according to the headstone inscriptions Charles was the sole burial in this plot, which is in the first row from the central path, whereas William and Emmeline were buried in the second row (XXXII: ED14).